Future Mars rovers could carry onboard water to perform subcritical water extraction in order to detect amino acids despite the presence of perchlorate in the Martian regolith. 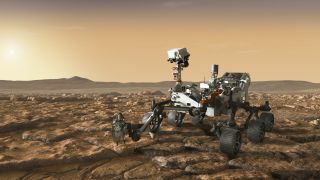 A new experiment designed to detect amino acids on Mars, in spite of the reactive perchlorate in the Martian soil that typically breaks organic compounds down, could fly on a future mission to Mars to help in the search for life there. Amino acids could be signs of life as we know it, past or present (though these molecules have been spotted on comets, suggesting that they can form abiotically off Earth without too much trouble). So naturally, when NASA's Phoenix Mars lander collected samples of the Red Planet's soil (aka regolith), scientists looked for these organic compounds. Yet when they tested the regolith for amino acids, they were nowhere to be found. There had to be some organic compounds, though, even if they just came from meteorites that landed on Mars. To get around the problem, a new tool was needed, and not only did it need to deal with the perchlorate issue, it also had to be simple enough to safely make it to Mars on the next lander. A recent paper by Aaron Noell at NASA's Jet Propulsion Laboratory (JPL) in Pasadena, California, looked at using subcritical water extraction (SCWE, pronounced 'squee') as a solution to the pyrolysis/perchlorate problem. "SCWE sounds more complicated than it is," Noell told Astrobiology Magazine. "We jokingly refer to it as making Martian espresso, because basically, you put high-pressure hot water into the soil sample. Pyrolysis is a very good technique for many compounds, but amino acids are preferably soluble in water." The view of the north polar region of Mars from the Phoenix lander, which discovered perchlorate in the Martian regolith. In his study, Noell used three different soil analogs (a JSC Mars‐1A simulant, an Atacama desert soil, and an Antarctica Dry Valleys soil) from Earth, as well as a control, to test the SCWE technique. He and his team tested SCWE at temperatures of 185, 200, and 215 degrees Celsius and for various times ranging from 10 minutes to two hours. They found "high yields of native amino acids…with minimal disruption of the distribution of those amino acids, even in the presence of a perchlorate salt," according to the paper's abstract. Samuel Kounaves, Professor of Chemistry at Tufts University and Lead Scientist for the Wet Chemistry Lab on the Phoenix lander, who was not involved in the research for this paper, thinks SCWE could be a good way to analyze Martian soils on future missions. "With some improvements, SCWE would deliver a lot of advantages to a space mission," he said, adding that he would like to see future tests try even higher temperatures than 215 degrees, which would make more large organic molecules soluble, and would also help researchers understand the full impact of the perchlorate on the SCWE testing method. He'd also like to see testing on Mars simulant soils that are closer to what's found on Mars than some of those used in the most recent research. Noell calls SCWE a "tantalizing technique" because the properties of water change as the temperature is raised, so scientists can use it to target other compounds when testing soils. "Amino acids have long been high-priority targets of the astrobiology community," he said. "We want to move on and start targeting… long-chain fatty acids and potentially even some of the polycyclic aromatic hydrocarbons (PAHs; these are large molecules made from hydrogen and carbon atoms), which are not typically soluble in water, but at the high temperatures of SCWE, they start to be." This means that if SCWE were part of a future mission's wet lab, one extraction solvent would work for a wide range of different types of compounds. Testing soils with SCWE has a third advantage: At higher temperatures, the process helps break apart polypeptides (short chains of amino acids linked together) into individual amino acids. This allows researchers to determine where the amino acids came from, which in turn provides clues as to the existence of life versus the building blocks for life. More elaborate chemistry often indicates life, Noell said: "When molecules of greater complexity are more easily found, then scientists can start determining whether past life, present life, or some abiotic Martian process is the most likely culprit." Then scientists can start asking the next set of questions about life on Mars, he added. For example, are the polypeptides similar to those found on earth? If so, in what type of organism are they found? Speaking of which, the perchlorate in the Martian regolith isn't all bad news. While it did get in the way of finding the signs of life scientists are looking for, its presence may actually be a good sign for the possible habitability of Mars. Yes, perchlorate is combustible, but as an anti-freezing agent it also facilitates liquid water on Mars, which would otherwise be impossible at an atmospheric pressure that's about 0.6 percent that of Earth. And since perchlorate can be broken down to release oxygen, it means there's an on-planet source of what we need to breathe. As for life on Mars, there may be little evidence to be found on the surface, no matter what the chemistry or techniques used to detail it. "At this point, all the evidence that I have seen points to the surface of Mars being bad for life — but we may find [life] underground," Kounaves said. "There could be some chemotropic bacteria that uses perchlorate as an energy source — there could be a whole ecosystem that even had liquid water available to it." So to find life on Mars, Kounaves said, "We are going to need to drill." The work was supported by the NASA Astrobiology Science and Technology Instrument Development (ASTID) program. NASA Astrobiology provides resources for this and other Research and Analysis programs within the NASA Science Mission Directorate (SMD) that solicit proposals relevant to astrobiology research.